The field of MRI is rapidly changing. Significant improvements have been made in safety in the MRI environment, including contrast administration safety. In addition, the role of novel PET/MR machines continues to evolve and could potentially change the way we practice imaging. The role of Breast MRI in screening high risk patients continues to grow and technologists need to be comfortable with performing these imaging studies. It is crucial that technologists and other radiology staff receive updates and education in the latest MRI technology, not only to maintain their national license requirement but to be able to provide the best care to patients and properly address safety issues with MRI. The one way to accomplish these goals is to provide an annual CME-type imaging seminar where we can select leaders in the field of MRI to discuss the changes, and how these changes impact the delivery of patient care. Restate basic knowledge of underlying principles of MRI. Discuss safety consideration of gadolinium-based contrast agents. 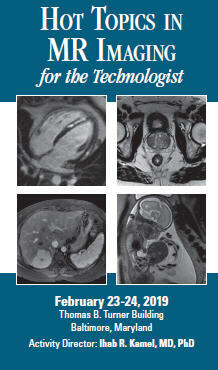 Define and apply the increasing role of MRI in imaging the prostate. Discuss the increasing role of MRI in pediatric applications. MS and MRI: How and When?